Aloha Bay Votive Holders, Candle Lamp, Brass Candle Holders! 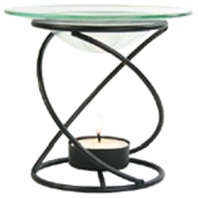 • Spiral Candle Lamp Black: Create a fresh mood in your space - naturally! Aura Cacia's Aromatherapy Spiral Candle Lamp helsps fill your home or office with true aromatherapy benefits derived from pure essential oils. Fill dish with 1 tablespoon water and up to ten drops of essential oil. Place candle inside lamp and light. Holds approximately 3 tablespoon of liquid. Measures 9.9 x 13.6 x 11.8 inches; 7.8 lbs. ORDER TODAY! 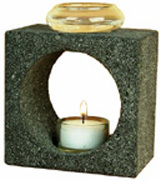 • Feng Shui Aroma Lamp: Natural Lava Stone with hand-blown glass bowl. Includes Palm Wax Tea Light and holder. 5" tall. Great gift idea! ORDER TODAY! • Brass 7" Antique Green Finish Taper Holder: ORDER TODAY! • Modern Glass Taper Holder: Clear taper candle holder. ORDER TODAY! 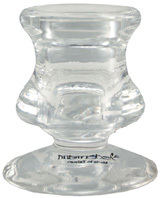 • Glass Taper Holder: (ORDER TODAY!